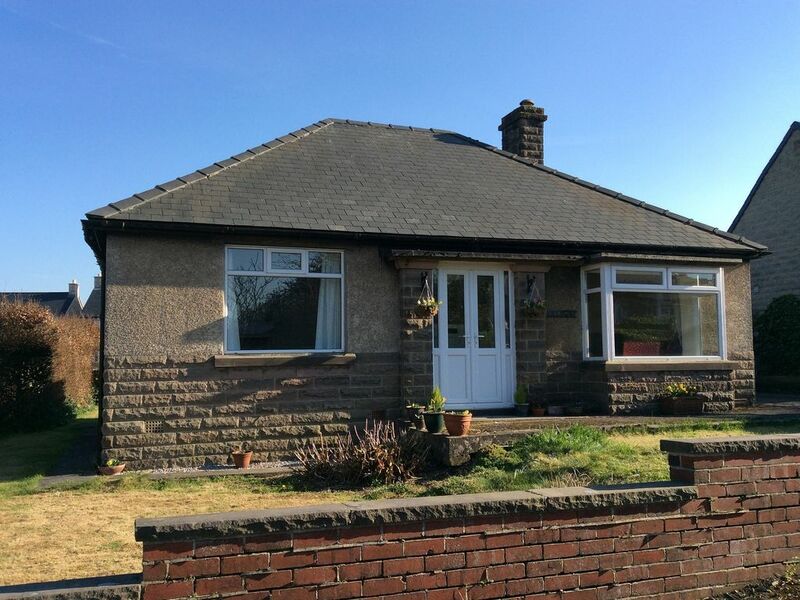 The bungalow is on a quiet cul de sac just minutes from the centre of the beautiful village and surrounding dales. Easily accessible with just one small step at the front and rear. Ample off road parking and lockable storage facilities if required. A clean and modern property with facilities including washer/dryer, dishwasher, TV, DVD & hair-dryer. The 2 bedroomed bungalow can sleep up to 5 persons. Hi, we are a local couple, both us having lived all our lives in the village with generations before us. A hard working family, both passionate about The Peak District and visitors enjoyment of it. The property was handed down to us, and we would like to keep it in the family. We want visitors to come and enjoy Youlgrave and the surrounding area, whilst staying in a true home- not just one aimed at making money from tourists. The property was left to us by a family member, and as we are both born and bred from the village, we decided that the property would make a fantastic holiday rental due to its ease of access as most holiday cottages in this area are challenging to get to to say the least. level access, ideally situated for village amenities, conveniently located for local walks and cycle routes and just minutes away from stately homes including Haddon Hall and Chatsworth House. And last but not least ample parking for at least 2 cars, with lockable storage facilities for bikes, climbing gear etc upon request. bathroom with bath/shower over, washbasin and wc. There are golf courses in the near by towns of Bakewell,Matlock and Chesterfield. Notes on accommodation: Clean and modern property with no stairs and just one step. In a great location for exploring the Peak District with off road parking. Gardens to front and rear, just a minutes stroll from 3 pubs,2 shops, bakery, cafe and local bus route. Youlgrave is a picturesque friendly village right in the heart of the Derbyshire Dales yet easily reached from many major towns and cities. Outside: Front And rear gardens with furniture supplied for outside seating. Cleaning / Towels / Linen / Maid service: Towels and linen included. Property cleaned after every changeover, more if requested. Other: good sized hallway. Lockable storage shed with lighting if required. Lovely cottage, nice and quiet. Owner very helpful, lots of info in cottage to help plan visits to sites. Great place to base yourself to make the most of beautiful surroundings. Thoroughly enjoyed ourselves. Hillsway is indeed a great place to stay if you want to enjoy the beautiful area. I’m very pleased you enjoyed your stay. Many thanks. Perfect. Great for a peaceful get away. We had a lovely time staying in the cottage. I was born and raised in the UK but now live in the US. We were spending 2 weeks traveling around the country. We had never been to Derbyshire and we are so glad we visited. The cottage was comfortable, had everything we needed and the perfect base for visiting. We spent time in Bakewell which was beautiful. We had dinner at the pub at the end of the main road. Just a really nice stay. Hillsway is indeed in a great location and I am always happy when guests find the property suits their needs. Thankyou for choosing to return, I look forward to having you. Due to personal circumstances we spent all our time in Mansfield hospice, but what little time we had there was good. The bungalow is a little dated but very comfortable and in a very quiet lane, the village has lots of character with 3 pubs serving good food, i definitely recommend the farmyard pub for a friendly welcome and lovely atmosphere, the food is good and it's dog friendly. The recently reopened deli and village shop alongside the well stocked Post Office are proving to be very popular. You are right, the village is beautiful and we are very pleased you enjoyed your stay. Thankyou. 30 minutes away from junction 28 of the M1. Matlock 10 miles, Buxton 12 miles, Chesterfield 12 miles. Youlgrave is a thriving village with a local butchers/deli, grocery shop and post office. There are 3 good village pubs all serving food, a cafe and a bakery. There are lots of nearby villages also with a variety of pubs and shops. 3 long distance walks pass through Youlgrave - The Limestone Way, The Alternative Pennine Way and The White Peak Way. The River Bradford and the River Lathkil both run at the bottom of the village making from some glorious walking, hiking and sightseeing. There are numerous disused railway tracks not far from Youlgrave which are now a Mecca for cyclists. Chatsworth House and Haddon Hall are both minutes from the village. Bakewell, voted the second best place to live in 2015, is just 4 miles away. An attractive market town with lots of independent and high street shops.